Paingod wrote: I suppose the question should be: Is getting out on a boat an easy way to break any police chase, no matter how massive, or did they shore up that exploit? If you can get to a boat and get going, you can break contact before the police show up. I really don't think that's an exploit, there just aren't a lot of police boats. Ubisoft is offering the chance to get a free copy of the original Watch_Dogs for PC through UPlay beginning tomorrow at 11:00 am EST. A tweet earlier today acknowledges an issue redeeming this offer and preloading the game, but a subsequent tweet says this is cleared up now, so if you had trouble with this before, you should try again. This offer will run until November 13th, but you will be entitled to keep the game thereafter. So I picked this up for free, never looked into these games before. Is there a mod scene for it like with GTA? I love playing around with modding games and this would be a prime candidate. Is there a mod scene for it like with GTA? I love playing around with modding games and this would be a prime candidate. Mod, Extra Lite Mod and Retail (disc and digital) version of Watch Dogs (full tutorial included). I do not guarantee that every mod in this pack will work as it should with other serious mods (e.g. TheWorse, Lunayah, Merged Mod). 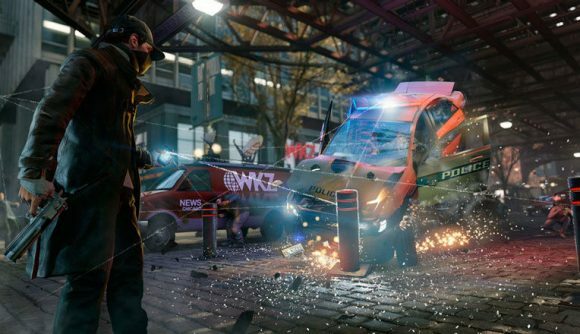 The original Watch Dogs didn’t exactly light the world on fire: critics found it a bit directionless and disappointing, set in a Chicago that didn’t feel alive. A new mod for the four-year-old game adds a ton of features that help correct that, and even restores some cut content. Modder The_Silver has created Living_City, which livens Watch Dogs’ up quite a bit by adding features like random events, ambushes, and custom missions. You’ll be able to return to building interiors that were restricted to story missions to explore them at will, use new hacks on civilians (like giving them money or draining their phone batteries), and run into random events. Sounds fun. I never got much into the game even after 4 tries. Maybe this would help. I played and enjoyed the first one for maybe 60-70 hours. My only gripe was that player invasions were too numerous, often leading to me disabling my NIC after starting up the game just so I could play in peace. As the audience matured, a lot of cheap tricks were employed frequently that made these invasions even less fun - hiding in booby-trapped tunnels, using remote locations to spot you, pausing the game frequently to detect attacking players. I picked up the sequel in the Steam Sale, but haven't touched it yet. I thought the sequel was excellent. They expanded the player options and gadgets and added several characters with whom you work. And the tone is lighter, at least for most of the story. Also hacked the ctOS server in the middle of the city... WITHOUT stepping into the patrolled areas. Found a camera then started hacking in from cam to cam, eventually finding the guy with the code, then from there to the server. Seems Dedsec was there already. And man, there sure are a LOT of outfits. I bought the gold edition which already comes with over a dozen. Turns out there are at least two dozen more. Tired to do a "convoy intercept", got killed dead. Same with the online missions. ARGH. How was I supposed to tail someone and hack someone when his minions just show up and machine gun me? EDIT: Apparently, I'm still in Act I (out of 5) and I shouldn't be tackling something like convoys. Hahahaha. Convoys are tough till you get some good equipment. I eventually gave up on them IIRC. I liked the ctOS puzzles because they felt real world rather than just some abstract. Also between them and the landmarks you were motivated to check out the entire map. I preferred the two Watch Dog games to the Assassin's Creed series, although I'll still give the nod to GTA V as the ultimate open world experience. I think it says a lot that while I've only completed two of the AC game campaigns, I felt motivated to complete both Watch Dogs game and actually replayed most of the first game. You might be playing the combat online missions. The tailing and hacking ones shouldn't have minions. Maybe one day Ill go back and give this a 5th go. No, it definitely was a one-on-one or tailing. I drove near the guy, separated by a couple trees, Just profiled him, when someone in the same colors rode up in a motorcycle, pulled out a shotgun, and started shooting me. I got invaded a couple times, lost once when the guy basically hit on top of buildings (didn't think of looking there). He even gave me clues when he tossed grenades at me. Got another two invasions, but I noticed they weren't acting natural compared to the AI pedestrians. As soon as they were ID'ed I pumped them full of lead. One try kept trying for a rematch, no thanks. I'm still short of 500 pts, muchless gajillion points for the progression. Did a couple more campaign missions, just met Damien again, I think I'm about to finish Act I. Did another gang hangout. Kept doing it wrong as the boss tried to make a run for it, and each time he got away. This last time, I started barricading the garage ramp exits with cars, cleared the first floor (carefully stuck to headshots, and lucky I keep getting them with my silenced 1911) Blocked the exit ramp again, went upstairs, hid in the stairs, profiled everybody, nailed 2 guards, when the other guard walked off, I went up behind the boss and cold-cocked him. Then killed the last two guards and made my exit. Went through prison and back. That armored guy was a PITA. I am pretty sure I didn't kill any cops during the prison escape... Shot them in the legs. Then managed to run downstairs, got a car, and made it through the legion of cop cars, then managed to switch cars, and found a tunnel to get away from the helo. And I am pretty sure I'm STILL in Act I. My approach in these ctOS center is firepower, but just enough so they don't call in reinforcements. For the 2nd center I basically silent snipered everyone I could. When reinforcements showed up, I just shot all of them from cover with an assault rifle, then cleaned up the rest. Took out a 4th ctOS center, and three gang hangouts. Finally finished Act I and 2 missions into Act II. Going vigilante is now risky. Instead of just a lone criminal needing a beatdown, they often run for cars, and/or call in reinforcements. And/or are armed. Still, it brings the most XP, at 500 a pop. Even campaign missions rarely give you that much early on. The trick seems to be get close enough and hide (cover) and when ctOS says intervene, jump up and RUN toward them, and immediately execute beatdown. If they are able to run, then catching them becomes problematic. And shootouts in the city now draws cops, which causes additional problems. I have less than 500 notoriety points in the online thing. I am contemplating turning it off entirely, which *is* allowed, but will reset notoriety to ZERO. I did that a number of times. I didn't care about building up a big score and there were times playing I didn't want to be interrupted. You can bypass this limitation by either unplugging your Ethernet cable or disabling your NIC after the game has finished loading. That was how I retained my score without dealing with invasions. Eh, it's okay. I'm getting rookies now who I can detect easily. It's pretty obvious who the hacker is... They don't "lounge" like civies or walk like civies. If they move oddly like not along the sidewalk they are obviously a player controlled character. They can't even pick a high up location with a way to jump off and have escape vehicles nearby. If they hack me in an open ground with no cover and no civies to hide among they deserve to be caught. The trick is to have my autoshotgun ready. As soon as I spot him I blast him 3 times. I got 12 out of 13 ctOS towers. Guess I should go do a couple more campaign missions. I've been protector/vigilante enough (solved 20 crimes). I just opened up the bunker and did another gang hangout. I have every weapon available and thus I *should* be ready for enemy convoys. Maybe. Finding the QR codes for the audio recordings are interesting for the back stories. As the bunker is still in Act II, this game should be a while yet. I'm level 23 character, I think. I suspect the trick on convoys is to block the traffic, then IED the vehicles and grenade the survivors... WITHOUT getting killed myself. Just did my 13th (out of 15) gang hangout. I am amazed how little I use my equipment properly. I decided to play the gang hangout like I play Farcry 3 (snipe my way in) and forgot to use prox IED to cover my flanks. Didn't make the same mistake next time. Had to beat down like 3 gang leaders. Also hacked the ctOS center on the island. Was able to sneak in on the side, silent snipe a couple, and ambush the rest, one at a time so they don't call in the alarm. I'm in mission 6 (of 12) in Act II, just did the raid on Viceroy projects and bugged all three terminals to access the tower. I think that makes it 12 out of 13 tower. I still can't believe I didn't use grenades much before this. Just as I hacked the tower, Viceroys sent in 4 car convoy of folks. Used steam explosion to take out one car, then shoot the folks getting out of another. Then an IED took out the rest. Just chased Bedbug out of his house. He keeps dying in the middle of my hack. Turns out, there's a bug that when you hack his house and he moves around, he'll fall through the floor and die. If you take a few shots (in the air, against the house, doesn't matter) and holster the gun. He'll NOT fall through the floor and you can hack in peace. I followed him at a distance then managed to follow him Splinter Cell style through compound full of enemies without being spotted. Then he's about to shoot Rabbit when I helped Rabbit escape, but Rabbit soon bought it (I don't know if it's even possible to help him escape, as suddenly, I'm playing him via third person camera...) he got killed, then I had to shoot the rest of the thugs. Fortunately, I have a good shotgun and they die quickly. Then it's a matter of getting out of range. Also did the exclusive CTRL mission, chase down a car with data, kill the CEO, and ditch the fixers/mercs, then reach endpoint to upload the data to DEDSEC. EDIT: Killed Crispin, snuck through the auction, then fought my way out. Finally, into Act III. Just met T-Bone, aka Ray Kenney. I got his truck back, he agreed to help me infiltrate Blume and ctOS. OTOH, I think I'll go hunt down the various recordings, investigations, and more (i.e. side missions) before I do any more campaign missions. I'm not really that much of a completionist, but it's kinda fun in this game.